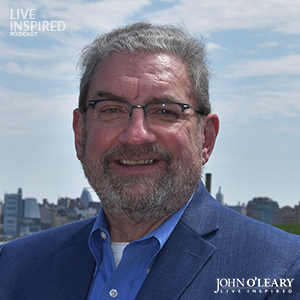 John O’Leary is joined by guest Gregg Easterbrook, New York Times best-selling author, on the Live Inspired Podcast to discuss the hard facts that prove the world is better now than every before. My friends, today's guest shares hard facts as to why this is the best time in human history. He'll expose which elements of your life are making you feel otherwise. Most importantly, share the value of recapturing a true, positive perspective + what it could mean for your relationships, business, life + world. Gregg Easterbrook is a New York Times Bestsellingauthor of the book It's Better Than It Looks: Reasons for Optimism in an Age of Fear. Today, Gregg reminds us it's great day + that the best is truly yet to come. The United States is in its best condition it's ever been: Pollution, discrimination, rate of heart disease + cancer are trending down. Life expectancy, education, living standards, middle class income, human freedom are trending up. It's easy to feel bitter--it's the path of least resistance. Being an optimist is hard but rewarding. Get Gregg Easterbrook’s book It's Better Than It Looks: Reasons for Optimism in an Age of Fear. Get Gregg Easterbrook’s book Beside Still Water: Searching for Meaning in an Age of Doubt. Check out Gregg's weekly "Tuesday Morning Quarter Back" column that he's written for 17 years, here. You are sitting on a bench overlooking a gorgeous beach. You have the opportunity to have a long conversation with anyone living or dead. Who would it be? Jesus, the greatest moral philosopher of the sapiens and the first question would be, "is there hope?". What is the best advice you've ever received? I view myself as an artist, not a journalist. "Listen to your muse." A muse often tells you things you wish you didn't hear. Follow your muse wherever she leads you. It's been said that all great people can have their lives summed up in one sentence. How do you want yours to read? He was debonair. If you enjoyed today's episode: Subscribe, rate & review on iTunes or wherever you get your podcasts. See you here next Thursday! The post Live Inspired Podcast: Cause for Optimism (Why the world is better than we think #121) appeared first on John O'Leary.